Online slot game and software developer Microgaming has a proven track record when it comes to releasing top slot titles with a spooky theme. The popular Alaxe in Zombieland comes with a distinct Gothic atmosphere whilst the spooky yet camp Halloweenies has been a favorite with slots players for a long time. In Taboo Spell, Microgaming continues this fine tradition of producing top notch slot titles with an eerie vibe. This 5 reel, 25 pay-line plays on the theme of witch doctors and voodoo which is a nice twist. The symbols in this game all add to the supernatural vibe present in this slot including a witch doctor, a skull, a crocodile, tribal masks and even a tribal princess. The dark reels enjoy the dim light that come from the tribal torches that lie on the cave wall where this slot is set. The pin cushion doll acts as the Wild symbol in Taboo Spell. Anyone that knows anything about voodoo will know how the pin cushion doll can be used to represent an individual and strike pain upon the said individual from afar. However, in Taboo Spell, you will only experience joy when you come across this bad boy. If five of these Wilds appear across an active pay-line then you will win 1,000 coins. It also substitutes for all other symbols, except for the Scatter, to complete winning combinations. The Scatter symbol is represented by Taboo Spell icon. This will pay out if two or more of the Taboo Spell Scatters appear across the reels simultaneously. This can award up to 50x your initial bet. 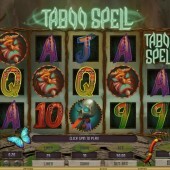 Taboo Spell also comes with a randomly triggered free spins bonus round called the Witch Doctor Free Spins feature. 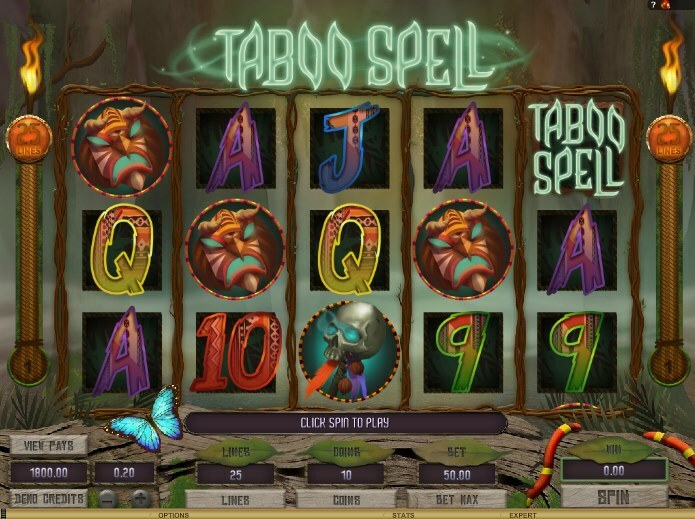 Once triggered, you will receive 6 free spins with all tribal mask and crocodile symbols turning into witch doctor symbols and increasing your chance of a big win. Taboo Spell might not have as many bonus features as some players would like but it is a solid game in its own right. Fans of other Microgaming slots such as the Twilight-inspired Immortal Romance or the millionaire-maker Mega Moolah will definitely want to give this slot a try. Its only real criticism is that it won’t keep players coming back for more due to the lack of bonus features and progressive jackpot.